We have been graced with the presence of many new reader/commenters over the last week or so and I decided that today I would feature a selection of them in the favourite five. I am curious to know how you all found my blog but I am glad that you did. We have a great community going here and your shared wisdom is an asset to my blog. Thank you! Geeta tells us about the wonderful way she has found to donate her unneeded items in this comment. She really gets to savour the full joy of her generosity. Gail had some good advice in her comment to discourage unnecessary purchaseds while out shopping. Will everyone welcome Leah on her journey to declutter. She has a long road ahead but every journey begins at the starting line and Leah tells us about her’s in this comment. Good luck Leah and bon voyage we are with are with you all the way. Eileen found the perfect way to spend precious time with her siblings and to make the most out of and sorting old family photos. Read about it in her comment. Sanna hasn’t been with us long either but it’s obvious she is a fast learner judging by the insight she gives in this comment regarding photos. In keeping with the reader/commenter theme I am only including blogs this week from my readers. I hope you enjoy them. Notes to Self by Alliandre ~ You will have to translate this one because Alliandre is Italian but google should be able to take care of that for you. If this link doesn’t work cut and paste http://ippe.blogspot.com/ into your search line. 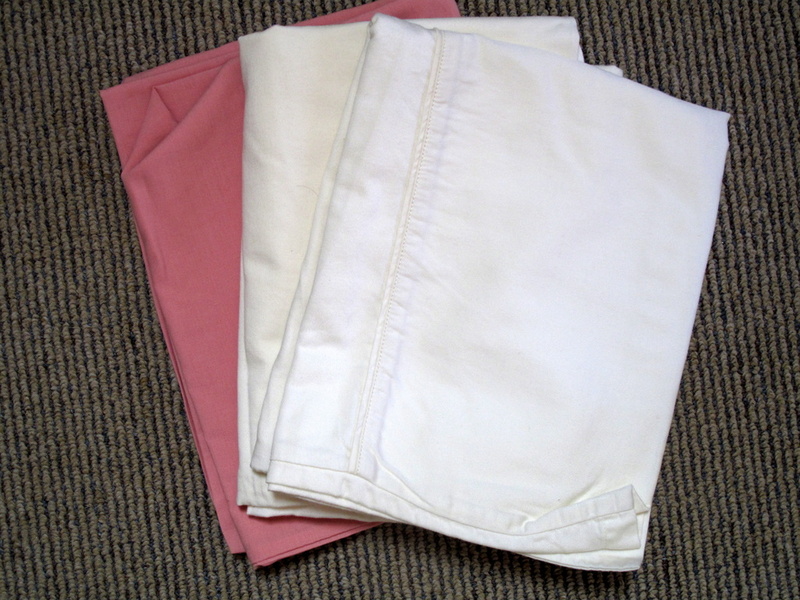 These three pillowcases (slips, shams whatever you want to call them) were excess to my needs. The pink one matches nothing and the others are king size and I don’t have king size pillows. Off to the thrift shop with all your other clutter buddies you go. Today my gratitude item is not a difficult one to remember. On this day last year at about 10:10 at night I received a phone call that I never will forget. The call was from the hospital telling me my son had been involved in an accident. When I asked if he was OK the response was “No, I’m sorry, he has sustained a serious brain injury and is in an induced coma and is undergoing test before we move him to ICU. I dropped that phone so fast, got dressed and was at the hospital before you could blink. My darling boy celebrates the first anniversary of the rest of his life today and my gratitude to God for his amazing recovering knows no bounds. My gratitude for the wonderful support not only from Cindy who stood in for me in my time of need but from all my wonderful readers whose prayers and well wishes buoyed my heart and gave me strength through the weeks that followed knows no bounds. I am also grateful that my husband was able to take a whole month of work so we could be together and give each other the strength to watch the scary recovery process. There were times when we thought our boy would never be the same but by the time my husband’s leave was up our boy was home and doing well. Every day I am grateful that we still have our darling boy to love and watch grow and hopefully this will be the one and only big scare we every have in our lives. Hi Colleen! I am very glad that one year later you have just a memory of the event and your son is well and healthy! Being a mother I can not even imagine how hard it must have been for you and your husband. But thankfully this has been just an obstacle and now it will be just a experience (bad as it was) that your son will have for always. So, let’s keeping loving people as you do and use stuff as you do, because that is the way to live 😀 😀 😀 !!! It surely is Annabelle, it surely is! I remember that day well, too. I can’t believe it was a whole year ago. Praises to God for his recovery. how time flies. And once again, thank you for all you did and keep on doing. What a wonderful day to celebrate for you! It’s those scary incidents that remind us of cherishing our ordinary life. How wonderful that all of you are back to ordinary again and can enjoy life together. the thanks always belong with you my wonderful readers who add so much to my blog with your great insight and wisdom. And yes your are right, sometimes we ought to be grateful for the hard times because without them the ordinary times wouldn’t be seen special. I remember reading your archives, and in some of them your son’s accident was mentioned, i didn’t realise it was that serious. What a joyous occasion today must be for you and what a Lucky boy your son is, firstly to survive and secondly for having such loving and supportive parents. May God bless you all. It was a very scary time. First we didn’t know if or when he would wake up and then when he did the damage to his brain was obvious. Slowly by surely he started to return, small things like yarning when he was getting tired rather than just being awake one minute and asleep the next seemed significant. It was the steps backward that really scared us, some morning we would arrive and he would seem to have made improvement but by the afternoon he seemed to slip back, that was scary and those were the nights I would cry myself to sleep. Some days he was so funny though and I would have to laugh, I know I shouldn’t have encouraged him but it was good to see him having fun. Like the day his young friends were there and he graffitied all over the hospital sheets, and the day he seemed to remember every swear word going. Little trouble maker, I was so glad of those times and we laugh when we tell him the stories now. He will never remember any of it though but he still enjoys hearing about it, just like my kids always loved to hear the stories about the funny and naughty things they did before they were old enough to remember. it still brings tears to my eyes when I think about it but there were a lot of beauty in the situation as well as the sorry. The three young friends that rallied around him who really made a big difference to his recovery. He was always so much better when they were around. Our friends and family who rallied around from afar, phoning and checking up on him and sending their love. My husbands sister, nephew and brother who turned up at the hospital from 500km away the day after to support us in our hour of need, sometimes distraction is a good thing. The brilliance of modern technology because I could send regular bulk text messages letting everyone know how he was doing. And how that technology also delivered the wonderful support from all my wonderful readers. Knowing all those prayers were being offered up for his recovery was comforting. How Cindy came to the rescue of my blog for that first month until I could slowly begin to take part in it again. Life is good when you can see the good in a bad situation. You and your family handled Liam’s accident and recovery with such grace and patience. I am so pleased and happy that you have all come through it so well. Thanks Loretta. I spent two hours with him today while he was stepping out into the traffic doing a photo assignment for uni. I was all the time thinking I hope we don’t undo all the year of healing while he is working through this task. It was my job to make sure he didn’t get run over, I was extremely vigilant you can be sure of that. Coming later as I have, I hadn’t appreciated quite how serious your son’s injury was. I truly thank God you have your whole son back with you all today – this is a date you will never, ever forget, but so wonderful that it can be a day of thanks! Thanks Ann, it surely is a day of thanks and relief. He went out on the town with his friends to celebrate. He has to stay away from alcohol for twelve months so this was the first time he has had a drink. I kept telling his friends to look after him and don’t let him drink too much. I think he did a good job of behaving himself because he was pretty spritely when he got up at 8 o’clock after only getting home at 3:30am. I woke at 3am and couldn’t get back to sleep until I heard him come in. I think I was lurking at this blog when Liam’s accident happened. I remember how serious it was. Thanks goodness he is much better now! Thank you for including my blog link! I really appreciate it! Thank you Low Income Lady and linking to you was my pleasure. I can remember you did send me words of encouragement and I was most grateful, thank you. I am so glad your son’s partner is OK too. What a difference a year makes! There must have been many sleepness nights. I’m so glad there was a happy ending..and very glad your son is doing well! Thanks so much for the shout out! I’m so honored to be listed! :)! it was a big year and glad it is behind it. Onward and upward!! It way my pleasure to add you to the five for Friday. thank you for the hugs, I had those tears in my eyes when I wrote yesterdays gratitude item. I think of that night every time I see an ambulance. I think of the lovely paramedic who attended the scene dropping into ICU in day 2 to see how he was doing. I can only imagine how you felt while writing that. I have lived though situations that cause me to whisper a little prayer for all the people and the families involved every time I see those flashing lights. I am thankful for the paramedic who stopped to see how your son was doing, so many who work in the emergency medical field get so detached – and I guess they have to in order to save their own sanity, but I know from my own experience what a difference it makes when someone steps up and shows they are human and really care. I agree with you I think that the people in the medical profession need to stay somewhat detached or they wouldn’t be able to perform their job properly for long. They would all end up in the psychiatric ward. i don’t think I could do it. i have a friend who is a nurse and I know some days she find it much harder than others and she is a very professional person. thank you, and thank you for being with me for so long on my declutter journey. Has it been a year?? I remember that day so well. We just all prayed and waited to hear the good news that your boy was FINE! That’s the best note of gratitude all year long. you have been with nearly all the way, thanks for being there and thanks for your support during that terrible time. Water under the bridge now thank heavens. I’m glad I could ring my mum with my recent accident – I’m sure she would have REALLY freaked out if it’d been the hospital! I can’t thank you enough Colleen for paying forward all the love others have given you on the blog – I really appreciate the kindness and love from this community (actually all my communities) I really do feel so loved! I have to say I freak out whenever the phone rings late at night these days, it sends a chill down my spine. I am glad that you feel a part of the community here at 365 Less Things. It is a nice place to be that’s for sure. And you are right it does feel good to be loved. I have had a blessed life in that department I must admit. Loving parents, loving husband, loving kids and loving friends all over the world. I like to think you get out of life what you put into it and there has to be a balance between giving love and loving yourself enough to accept it in return. It doesn’t seem like a whole year has gone by – how wonderful that Liam has had a full recovery. Your heart must be full to bursting today. he’t got scars and a crooked yawn and his short term memory isn’t what it should be but he still thinks he’s awesome so who am I to argue. 😆 And yes my heart is busting with gratitude as this situation could have easily had a far worse outcome. Happy, happy anniversary and praise God for His amazing blessing on your family, especially your son. What a day to celebrate! I’d like to share something that was very effective in my de-cluttering. For anyone of course, but reading Leah’s comment is what made me think of posting it. I would frequently go through the items in my clothes closet and take out a few pieces, but it always stayed STUFFED. Then I hit on a great technique. My closet is divided down the center by shoe shelves. On the right side I put only things I loved to wear, wore often, were in good shape. Every thing else on the left. Ii was very crowded at first, but so worth it. This gave me a section of the closet where there was space around my clothes, that I enjoyed choosing clothes from every morning, that was easy to maintain neatly. I think having a ‘minimalist’ closet on one side right from the begining, gave me the mental staying power to deal with the other side. Great tip Sabine I have added to this week’s favourite five comments. I posted my first comment before I had read through the whole post, and now am feeling terribly awkward about a decluttering comment after all the thankfulness ones! I remember reading when your son was injured in the archives, and quickly scrolling through the updates to find out how he was. How I wish you could have fast forwarded as I did, to know he would be alright. Happy anniversary: enjoy every day. Don’t feel awkward Sabine the post is about decluttering first and foremost. I wish I could have fast-forwarded like you that’s for sure. To see the earthquakes we have experienced and survived see http://www.canterburyquakelive.co.nz/. It has been an unbelievable experience. So far we have had 7709 earthquakes and aftershocks. I strongly encourage everyone to have an emergency kit. Hi Nicky, may I extend to you a warm welcome to 365 Less Things. What an experience for you to have to live through. How long will it take before you are informed of what is happening to your home? It must be a little unnerving not to know what your future will be from day to day. Unfortunately in circumstances such as these there are so many people needing to be attended to that one just has to be patient until it is your turn. It certainly is an occasion to reassess your belongings, what is important and what is just excess. Living in an area of volcanic upheaval like NZ anything can happen anytime so the less you have the less there is to lose when the inevitable happens. I am glad my inspiration to declutter was a lot less dramatic than yours. I was living in the Seattle area in the US in 2001 when the Nisqaully quake hit. It was a 6.8 magnitude but luckily it was deep so didn’t do as much damage as it could have. It certainly didn’t do the sort of damage your quakes caused this year. And now look at the mess in Turkey this week. I am glad to be living in Australia smack bang in the middle of a tectonic plate unfortunately for you NZ is right on the edge of that plate where all the movement happens. That said, there was an earthquake right here in Newcastle where I live back in 1989 in which 13 people were killed and over 160 injured so even we aren’t completely immuned. I wish you luck in your decluttering journey. As you say the less you have to move and store when the time come to repair or replace your home the better. Life has a strange way of turning us in a different direction sometimes, doesn’t it? My tip for de-cluttering the wardrobe is this… Get rid of all the horrible assortment of coathangers that you accumulate over the years and then invest in some decent quality wooden ones from a well known storage supply company that will last (they are really not that expensive either). Empty the wardrobe completely and discard clothes to go to the charity bin that you know you need to get rid of. Then, start rehanging your clothes with 1 item only per hanger, so items don’t get covered over and forgotten. I then hang clothing from white through to black and group the colours in between. You will very quickly realise that you really don’t need another white shirt or pair of black pants and when you go hunting for a particular item of clothing, it’s really easy to find. I also pack away winter boots into neat storage boxes so they are not taking up room in the wardrobe in the middle of summer. I now enjoy going into my walk-in-robe rather than dread it! Great advice Elaine. I did as you advice regarding the wooden coat hangers some years ago. I have actually declutter so much clothing since then that I have given away two boxes of those coat hangers and still have more than I need. They do look much nicer than the bunch of scatty old ones I used to have. And the dry-cleaner hangers go back straight back to the dry-cleaner when I pick up the next pair of pants.